At CaregiverNC, we believe that choosing a Caregiver should be your decision, and one free of hassle and worry. Through our CaregiverNC Web platform, you can create a profile that describes the characteristics of the ideal Caregiver for your needs. Our database then matches you with a list of Caregivers to choose from who meet the criteria you identified when creating your profile. Our accredited Caregiver registry in North Carolina puts you in control and helps you easily and confidently find the home care professional who is right for you. Take charge of your home care needs today by utilizing CaregiverNC’s matching database, and find a qualified Caregiver to be a part of your home. Contact Us today for more information on our Accredited Caregiver Registry. Create a profile for Care Seekers to review and assess based on their individual care needs. We screen and verify each Caregiver and their credentials to ensure that professional standards have been met before adding them to the CaregiverNC registry. Describe your qualifications as a Caregiver so we can match you with someone searching for your specific skill set. Create a profile describing your Caregiver requirements to start the process of finding Caregivers in your area. 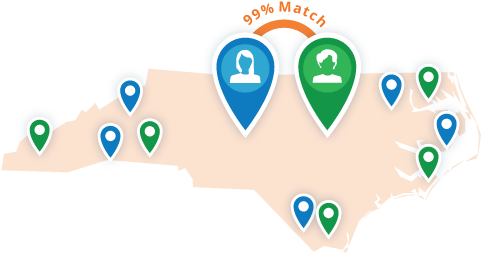 Our database automatically matches local Caregivers to the requirements you specify in your profile. Choose your best fit from a list of pre-screened and verified professionals who match your specified needs.